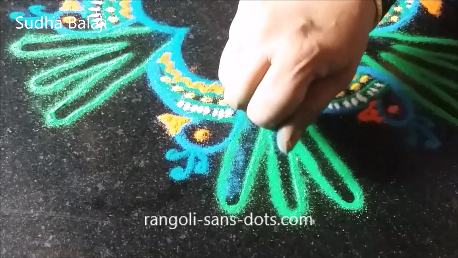 Drawing a free hand peacock in a rangoli is a challenge. 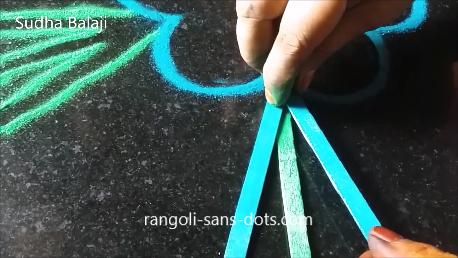 So I have used the now common technique of mine - using household objects like CDs , bangles to get some basic shapes. 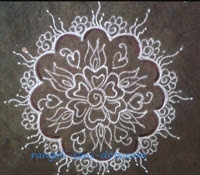 In this rangoli I have used bangles and ice cream sticks ( popsicle sticks ) to get some of the patterns. 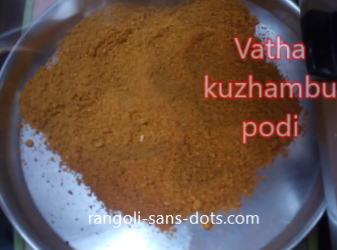 The images below should give a step by step explanation for making this design. 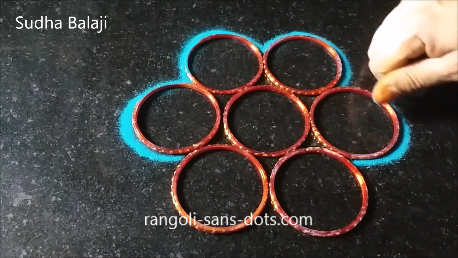 Place seven glass bangles as shown in the image below. 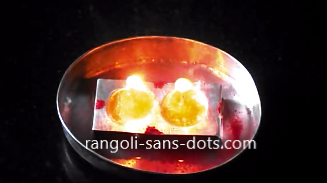 The next two images show how ice cream sticks - three numbers are used to get the tail. 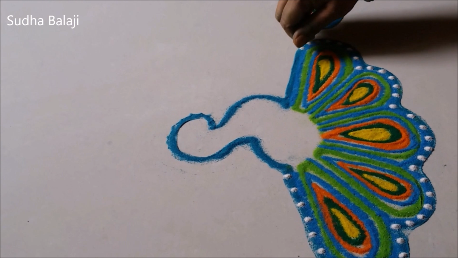 Place three at inner edges of the pattern and draw outside the sticks and gently remove them. Draw the head and neck of the bird in the gap. 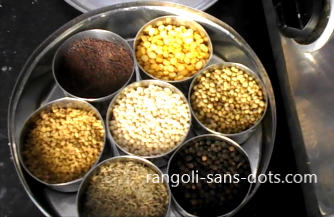 The next photo shows it. 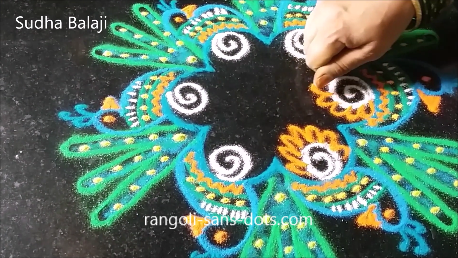 As far as possible I add the position of my hand or fingers to emphasise where the rangoli is progressing. Next come the eyes and beak and the outline of all birds is complete. Next some decorations inside on the body that is visible in yellow . 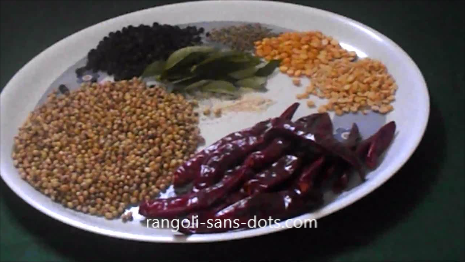 Fill the tail with blue and green colours. The decorations of the plumage are over. 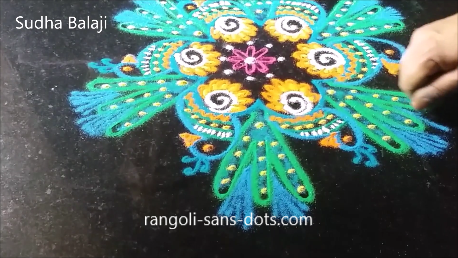 Now the inside of the rangoli is filled with decorations according to our imagination. The next two images show how . 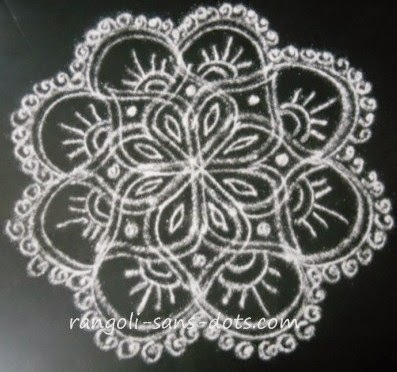 We can add a floral design at the centre made by a cotton bud. 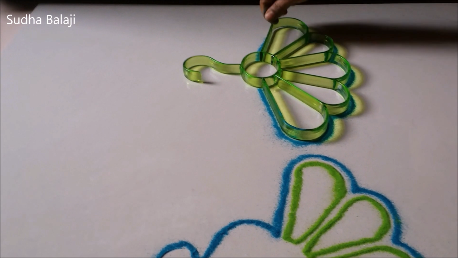 Since the peacock invariably has a long tail and the ice cream sticks are short I added the extensions of lines. 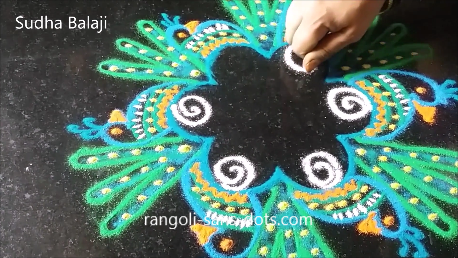 This method , I presume is one of easiest to create best peacock rangoli designs for competition in schools and colleges. 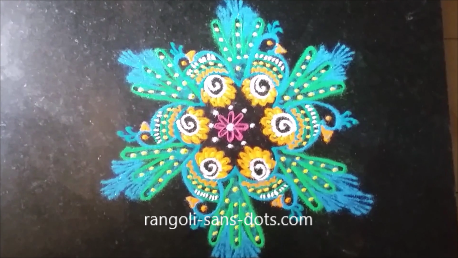 Also may be useful for beginners who are interested in peacock drawing in rangoli. 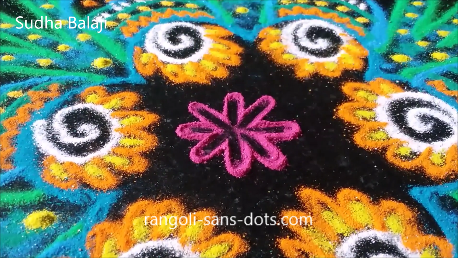 This video shows a smaller and simpler version of the above rangoli. The procedure is the same with the use of paper cups and ice cream sticks to form the tail. 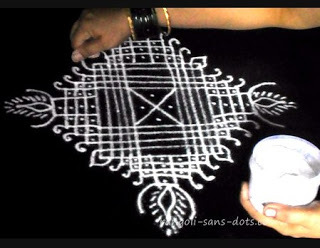 However the centre is decorated with simple floral patterns using cotton bud. 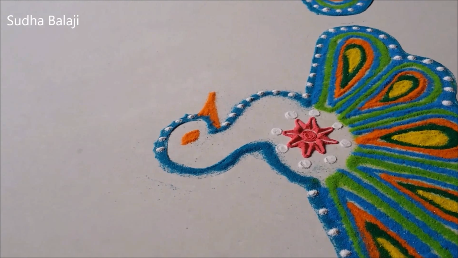 The decorations to the peacock , the tail are also simple. 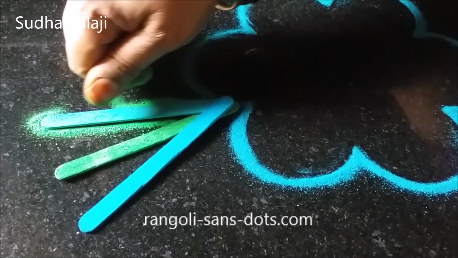 So a simple beginners rangoli for Diwali. 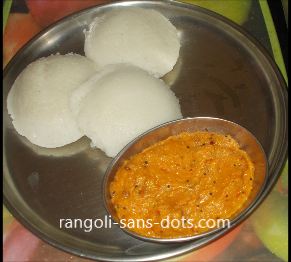 Peacock muggulu as they are called are also popular during Sankranti ( Pongal in Tamil ) that is celebrated after Dhanurmasam. 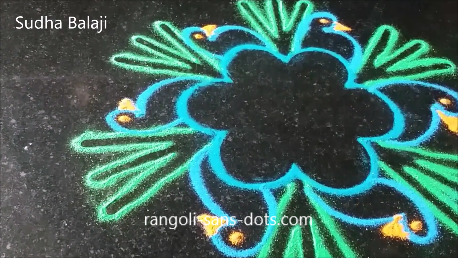 We have big traditional rangoli adorning the homes. 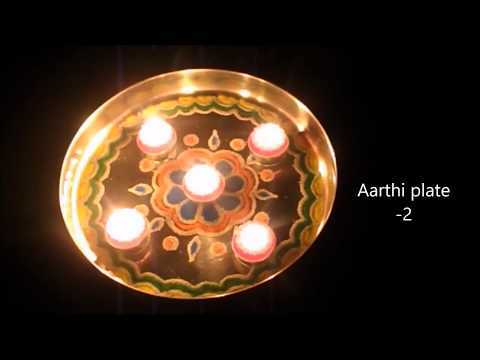 If we want we may also add a simple and creative idea like this for festival decoration. I purchased clothes hangers from a shopping mall in Chennai . 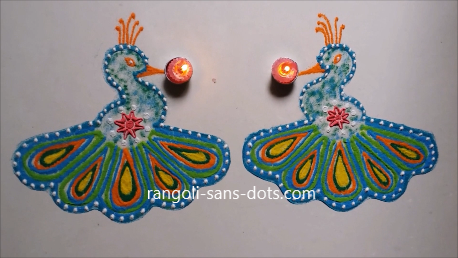 I discovered that the hangers could be used to create simple peacock patterns . 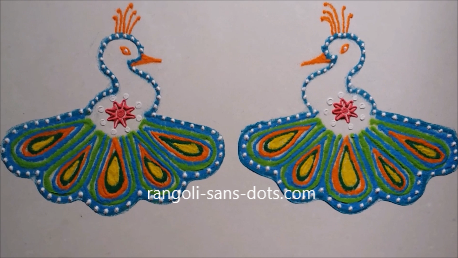 I tried using multi colours and the result is in the pictures below.